Yes, this is my first post ever in the South Bay. 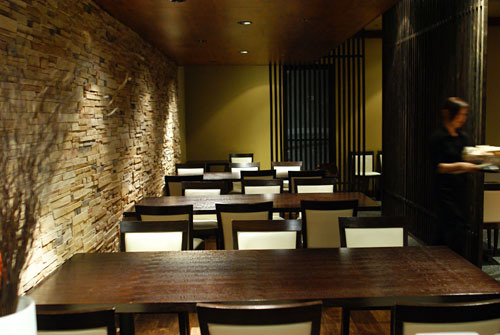 For this "momentous" occasion, I've chosen Niwattori, a new izakaya-style eatery that opened in late September. 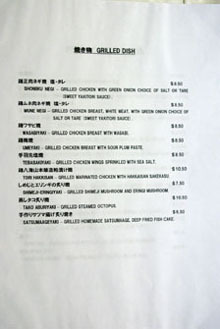 The name, Niwattori (usually spelled niwatori), translates roughly to "chicken," and indeed, the restaurant specializes in dishes featuring its eponymous bird. 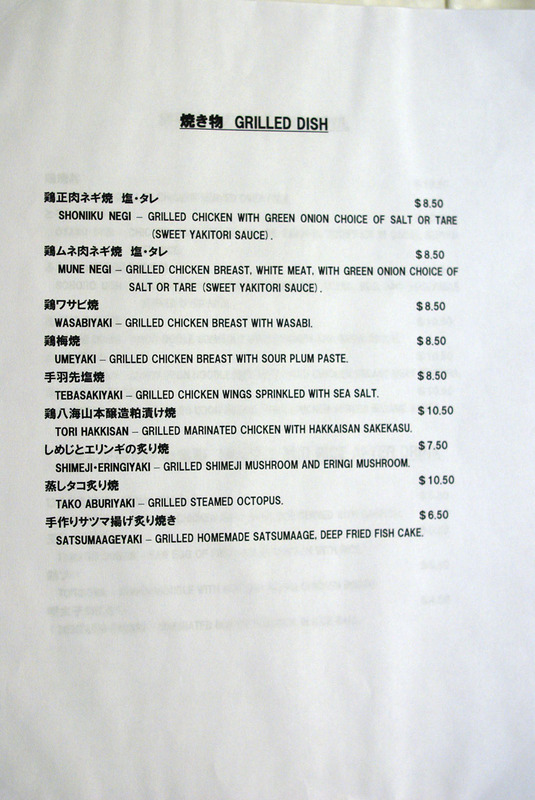 Note however, that Niwattori is not a yakitori joint (a place that focuses on grilled chicken skewers). Going in, I thought that Niwattori was owned by the same people who run Yuzu a few doors down. The woman in charge of managing the Niwattori, Kumada-san, assured us that that was not the case. 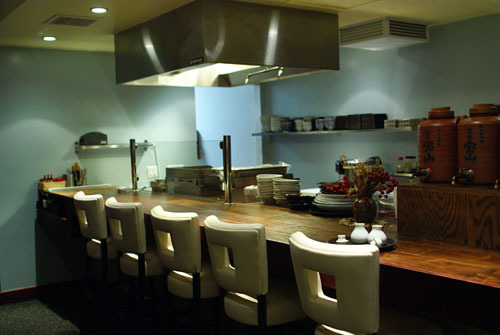 The two do share certain ties, however--the chef at Yuzu is Kaz Akutsu, and Akutsu-san is largely responsible for the menu at Niwattori as well. Interestingly, he is the nephew of Seiji Akutsu, the owner of famed soba house Otafuku in Gardena (one of Urasawa's favorite restaurants). There is also, apparently, a passageway in the building linking Niwattori and Yuzu physically. Inside, the space is clean, contemporary, and is divided into a bar section, a main dining area, and some semi-private rooms. Niwattori's menu is shown above; click for larger versions. 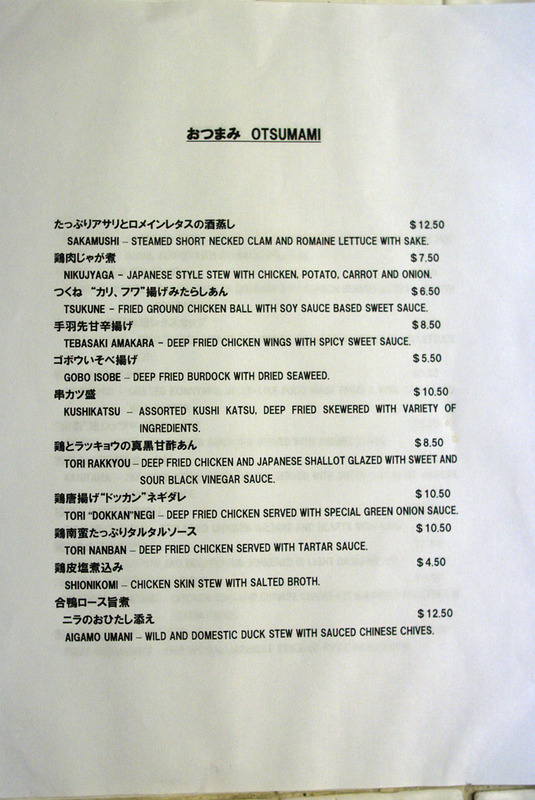 As you'd expect, it's skewed heavily towards chicken, with nary a meat or raw fish dish in sight. 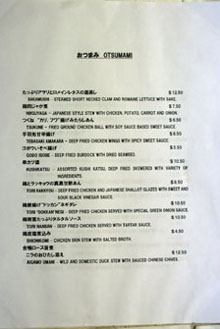 Note that otsumami refers to small dishes typically eaten while imbibing alcoholic beverages. And speaking of booze, what better way to start than with a round of Asahis? Note that this is the real deal Asahi Super Dry, imported from Tokyo, not the stuff brewed by Molson in Canada that one usually finds Stateside. If you haven't had the genuine article before, I urge you to do a comparison between the two versions. I don't think I've ever met a potato salad that I didn't like, and this was no exception. 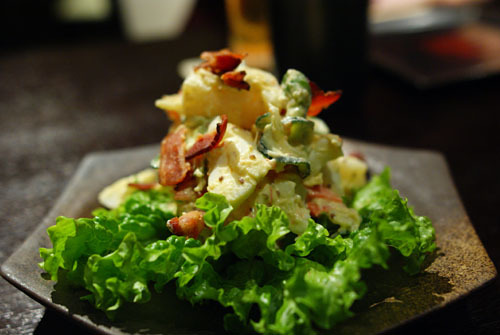 Pleasantly piquant in savor, the salad was heightened by the use of bacon, which lent a wonderful saltiness to the whole creamy amalgam, in addition to providing a nice crunchy textural element. 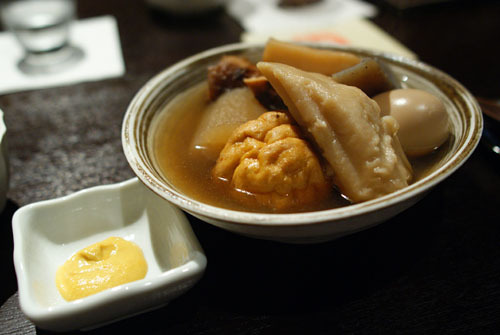 Nikogori usually refers to jellied fish (see a version made with fugu here), but Niwattori's uses chicken skin encased in a chicken broth gelée. Tasting it, I experience the unmitigated essence of chicken, which was subsequently tempered by the tart cucumbers pickles (kyuuri) and wakame seaweed. The momiji oroshi (grated daikon and red pepper), meanwhile, added a bit of heat into the equation. Next was my favorite course of the night. What we have is tori sasami, or chicken breast meat, seared rare, served with wasabi, nori, and onions. 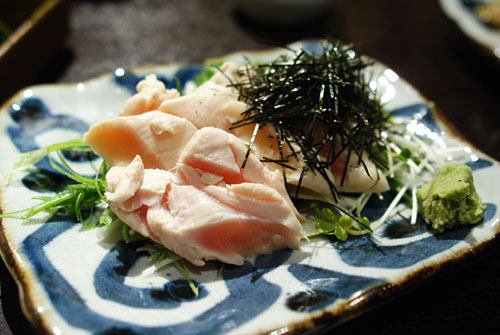 The chicken was immensely tender, delicate even, and took on an almost sashimi-like character. 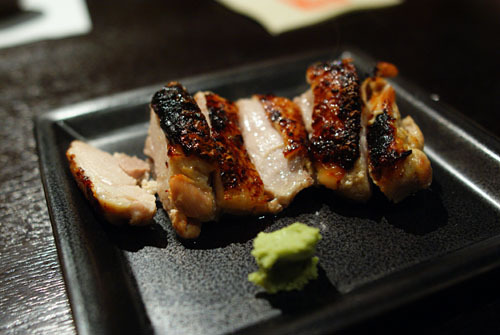 Flavor-wise, it possessed the subtle spirit of chicken, which was superbly countered by the fiery wasabi. I had a similar dish at Kokekokko, but liked this version even better. 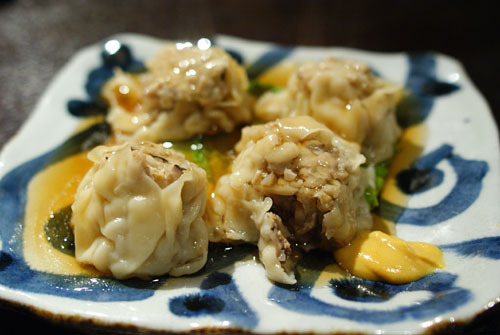 Shumai is, of course, a Chinese dish, so it was interesting to see Niwattori's take on the classic. The Chinese usually employ pork as the filling, but here, chicken was the star, along with ginger, lotus root, and dried shiitake mushrooms. I rather liked the result, savoring the shumai's rich, savory, ginger-tinged flavor, offset by the sweet/sour ankake sauce and spicy karashi mustard. 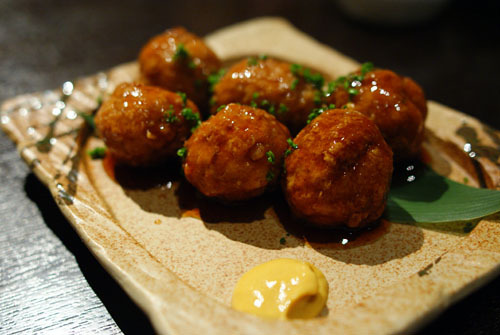 Tsukune refers to Japanese-style ground chicken meatballs. Though they're typically prepared in a yakitori (grilled) manner, frying or baking are acceptable cooking methods as well. The version here was fried, and came dressed in a sweet, soy-based sauce. The result was a very savory, gritty, juicy experience. However, I found it rather heavy-handed unfortunately, with the sauce overpowering the chicken's natural sapor. The karashi did help in balancing things out, though. 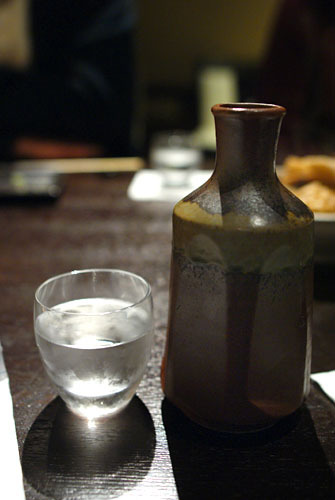 With our beers dispensed with, we moved on to sake, specifically the Hakkaisan Honjozo [$26]. Interestingly, we had it warm, which is something I almost never do, as heating is usually reserved for inferior-quality sakes. The Hakkaisan certainly was no such beast, and could've easily been served cold. As it turns out, the sake was indeed quite delicious hot. I thought that the heat tended to smooth out the flavors of the sake, accenting its nutty/earthy flavors while muting the floral and fruity flourishes. 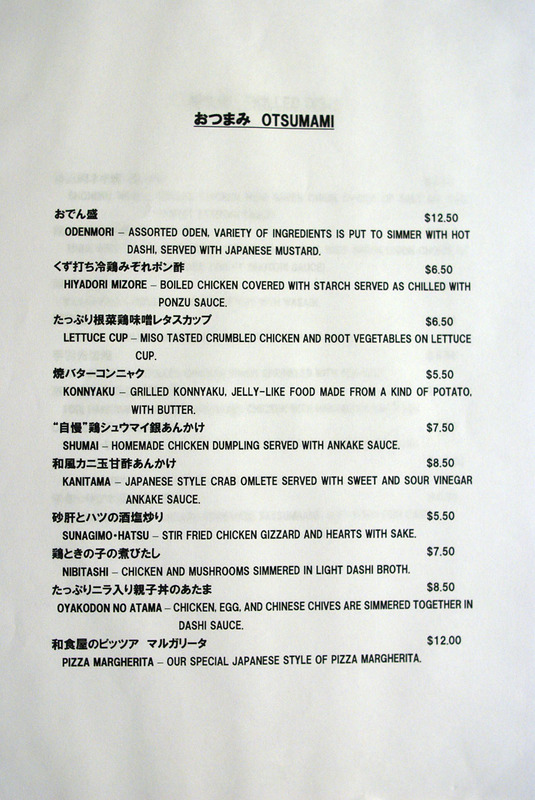 Nankotsu refers to the cartilage, or gristle, of the chicken. 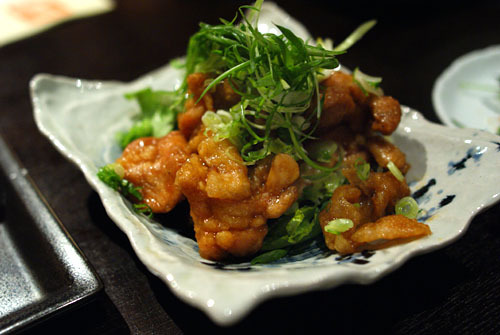 Here, we had fritters of chicken tenderloin, with cartilage attached, deep-fried. Though the nankotsu didn't have much taste on its own, it did contribute a lovely (and loud!) crunch to the eating experience. The flavor came mostly from the attached bits of tender chicken, and was nicely countered by the sour tang of lemon. 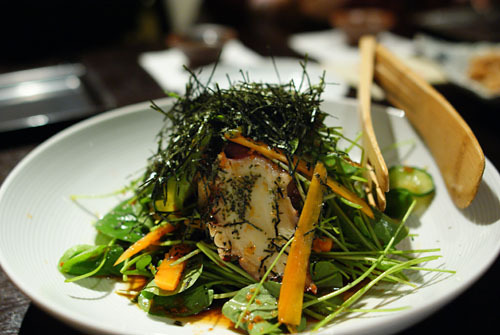 Here we have an appealing salad of octopus, watercress, carrot, cucumber, and nori. I appreciated the octopus' supple, tender consistency, as well as its subtly sweet flavor, which was deftly countered by the pungent bitterness of the greens. Quite nice. A fascinating dish, this was a grilled presentation of chicken that had been marinated in Hakkaisan sake kasu (sake lees, the residual precipitates left over from the sake-making process). The bird was wonderfully tender and succulent, abound in chicken flavor but with a finish imbued with the rice-y marrow of sake. Superb. Next up was deep-fried chicken, coated in a sweetish soy-based sauce, topped with green onions. 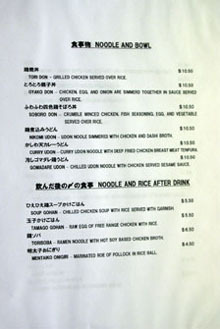 Taken alone, the chicken was a bit too sweet for me, but its flavor was expertly balanced by the bitter tang of the scallions. I only wish that the pieces had been fried to a crispier consistency. 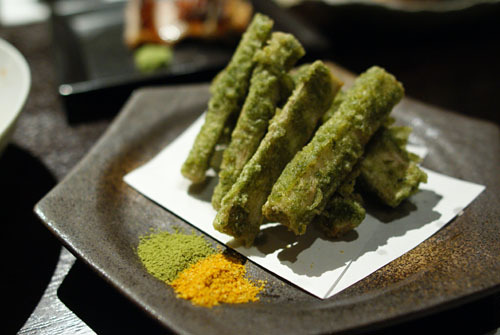 This was deep-fried gobo, or burdock, with dried seaweed, accompanied by two dipping salts--curry (kare shio) and green tea (matcha shio). 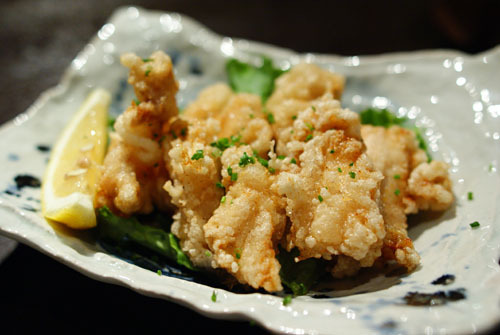 The gobo itself had a delightfully firm, fibrous texture and a flavor that was mildly savory. I found that the curry tended to overwhelm the flavor of the burdock, but I did appreciate the matcha. Our final tipple was a flask of the Hakkaisan Junmai Ginjo [$26], which we had cold. I've had this sake multiple times before, and again, it did not disappoint with its clean, floral flavors and softly spicy character. Very nice. 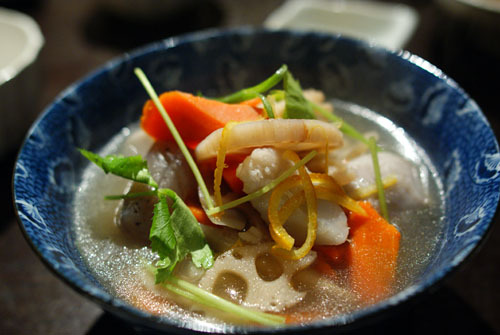 A prototypically winter dish, oden consists of a variety of ingredients simmered in a soy-dashi broth, served with karashi. 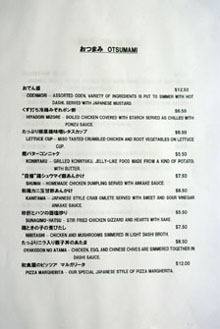 The contents of the pot here were chikuwabu (tubes of gluten, popular in the Kanto region), konnyaku (konjac gel), daikon, tamago, and ganmodoki (tofu fritter), among others. It was a hearty, heartwarming dish, with the ganmodoki and the hard-boiled egg being particularly tasty. Interestingly, one of my dining companions remarked that, due to the color of the broth, the chef must be from the Kanto (or greater Tokyo) area and that the oden might be more appropriately called by the obscure term kantoni. 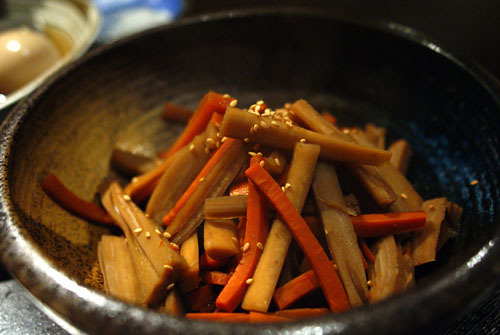 Kinpira denotes a cooking technique of sautéing and simmering root vegetables in a mixture of soy and mirin (sweet rice wine). Burdock, carrot, and lotus root were used here, sliced in large-ish pieces, giving the veggies a nice bite. Their flavor was simultaneously sweet yet savory, with the sesame providing a lovely accent. 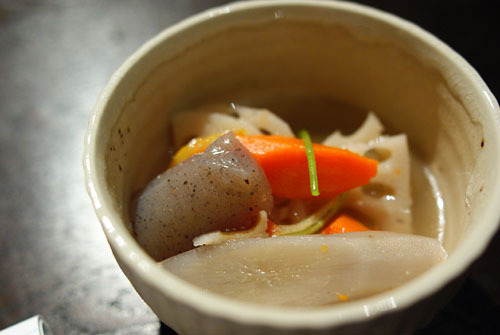 Here was a type of nimono, or stew, specifically a chicken skin stew in a salted broth, with lotus root, carrot, and konnyaku. They key here, for me, was the application of yuzu skin, which gave the whole commixture a charming, tangy finish. 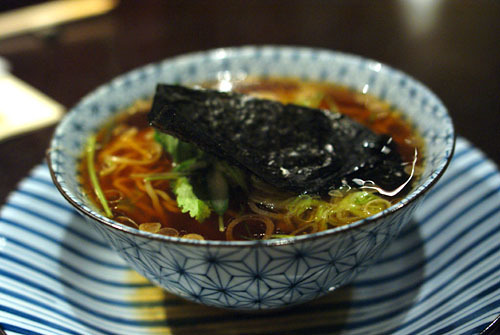 We finished with a bowl of ramen noodles in a hot soy-based chicken broth. The noodles themselves were nice enough, and I enjoyed the lightening effect of the vegetables, but the broth was on the salty side unfortunately. Overall, I left Niwattori generally pleased, especially considering that the place just recently opened. One of my dining companions, who's much more well-versed in Japanese cuisine than I, agreed, but remarked that he'd like to see the chef employ lighter, more Kyoto-influenced touches with the food. 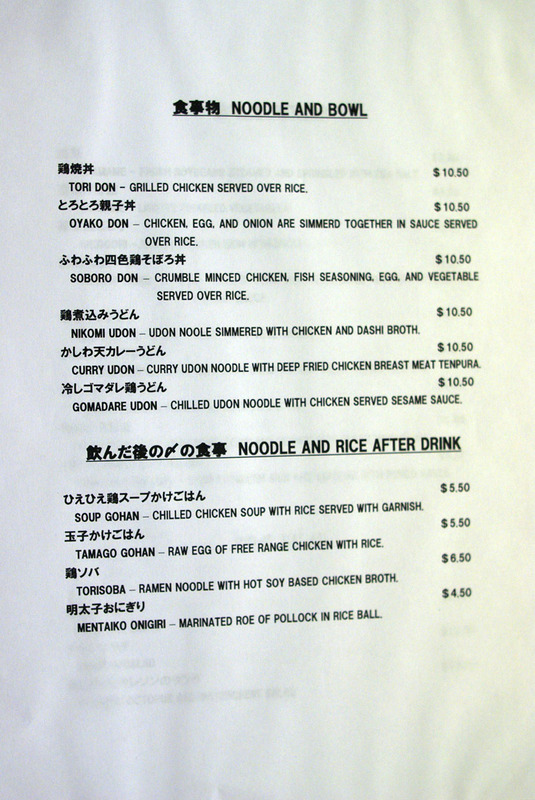 I see his point, especially with regard to dishes such as the tsukune, oden, and torisoba. In the end, it was nice to have some dishes that you don't see on menus all that often, and to experience the breadth of what's possible using chicken in a non-yakitori setting. Another place to try for me in the South Bay. 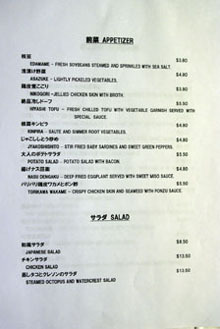 I'm not sure if I could handle eating raw chicken, but the other dishes looks pretty good to me! 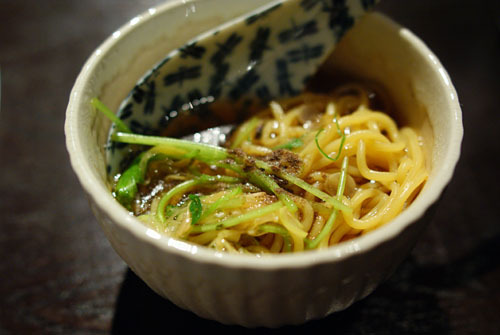 Your friend are right on one thing the dishes have lots of Kyoto-influenced, such as Shionikomi(塩煮込み) are consider a "regional special" of Osaka. But your "frind" might want to check his/or her source. Kyoto is part of Kansai (Osaka are part of it) not Kanto (where Tokyo are located). 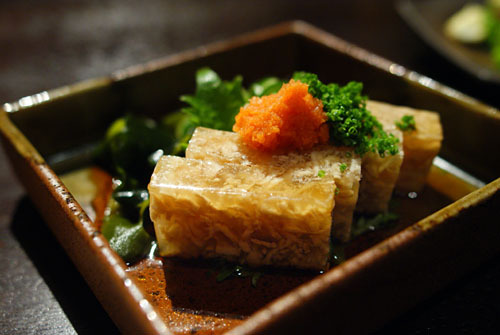 Tokyo being a melting part of "regional cusine", sometime it can caz' misconception. 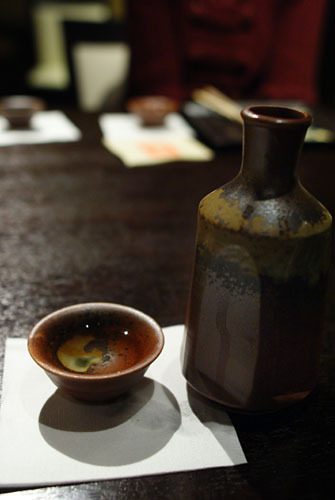 Kanto-ni(関東煮)which are serve with soy sauce not Karashi(芥子) a type of mustard, like you shown in the picture. Per the menu, the broth is dashi a form base of miso, which means the oden are call miso oden (味噌おでん) from Aichi Prefecture(愛知県 -- direct between Kanto and Kansai) or Ehime Prefecture(愛媛県 - part of Shikoku the smallest and least populous island in Japan). The version you have are more likely from Ehime Prefecture because Oden from that prefecture are serve to customer with they wait/before ramen. I was recently there and really liked it as well. Fyi, they had some spectacular sashimi while we were there. And the Hakkaisan chicken was unbelievably amazing. I will have my blog review up soon. I need to get some clarity on the ownership thing as we have a relationship with the owner/manager of Yuzu, and she made a point of escorting us into Niwattori and introducing us to everyone as if it were her own. Dason: I believe that there was a misunderstanding. My dining companion actually thought that the food was too Tokyo-influenced, and that it'd be nice to have more of a Kyoto style at play. He mentioned that Tokyo style oden tends to use more soy sauce in the broth. Andrea: From what I gathered, it seems like the owner of Yuzu helps manage Niwattori as well. And you had sashimi there? Sashimi's not on the menu, but I was told that it was possible to order items from Yuzu at Niwattori. Ila: You're welcome. I still need to see what all the fuss is about over at Torihei! Nice. 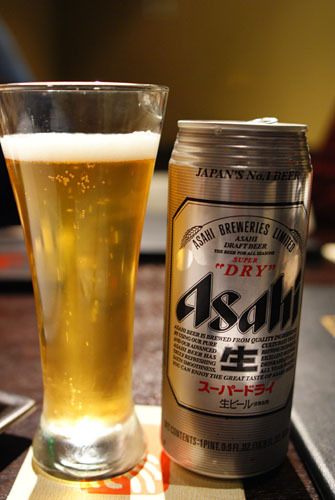 I have always preferred Sapporo, but I admit I have never had the "real deal" Asahi. I would like to try that.